After nearly three months, countless debates, and a fair share of controversy, our countdown of the top 100 NFL players of 2011 has finally reached the cream of the crop. These guys are the very best of the best, and have helped raise the bar as to how greatness is measured at their particular positions. So without further delay, here are our top 10. 10. 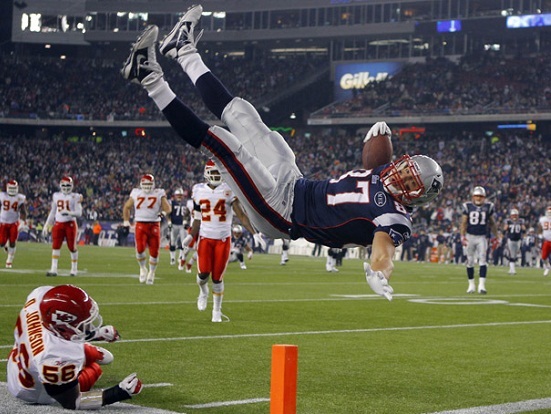 Rob Gronkowski - TE, New England Patriots: Last year, in just his second season in the league, "Gronk" set the single-year record for total touchdowns (18) and receiving yards (1,327) by a tight end. He also became the first tight end in NFL history to lead the league in TD receptions (17). 9. Larry Fitzgerald - WR, Arizona Cardinals: Simply put, Fitzgerald is one of the most dangerous wideouts in the game today, capable of putting up huge numbers no matter who his quarterback is. Despite the fact that Arizona juggled between Kevin Kolb and John Skelton last season, Fitzgerald still managed to haul in 80 receptions for 1,411 yards and 8 scores. 8. Patrick Willis - LB, San Francisco 49ers: In 2011, Willis was the dominant figure on a San Francisco defense that didn't allow a rushing touchdown until Week 16 -- an NFL single-season record. On the year, he recorded 97 total tackles, 2 sacks, 4 forced fumbles, 2 fumble recoveries, and an interception for good measure. 7. Maurice Jones-Drew - RB, Jacksonville Jaguars: MJD outdistanced the field with 1,606 rushing yards last season, a career-high. He also added 43 catches and 11 total touchdowns (8 rushing, 3 receiving). Jones-Drew has now cracked the 1000-yard mark in each of the last three years. 6. DeMarcus Ware - DE, Dallas Cowboys: Ware could very well be the premier pass rusher of the NFL. He finished second in the league with 19.5 sacks in 2011, and has averaged 14 sacks per season over the course of his career. Last year, Ware had a 4-sack performance (albeit in a losing effort) against the Eagles in Week 8. 5. Terrell Suggs - LB, Baltimore Ravens: The former Arizona State Sun Devil had his finest season as a pro in 2011, registering 70 tackles, 14 sacks, 7 forced fumbles, and 2 interceptions. Suggs' stellar performance earned him NFL Defensive Player of the Year honors. 4. 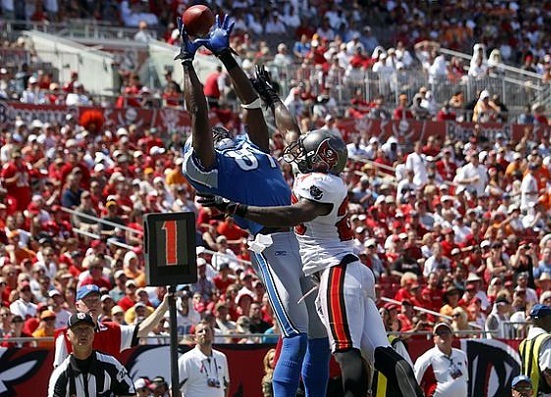 Calvin Johnson - WR, Detroit Lions: "Megatron" has long been considered one of the most dominant receivers in the NFL, but he hadn't quite broken through -- until last season. In helping the Lions reach the postseason for the first time in over a decade, Johnson set career-highs in receptions (96), yards (1,681), and touchdowns (16). 3. Drew Brees - QB, New Orleans Saints: Brees had come close to breaking Dan Marino's single-season record for passing yards (5,084) before, but he left no doubt last year when he shattered the mark by 392 yards (5,476). Brees also led the league with 46 touchdown passes. His spectacular season helped the Saints reach the playoffs for the third-straight year. 2. Tom Brady - QB, New England Patriots: Brady is rapidly approaching "greatest signal caller of all-time" status. In leading New England to the Super Bowl for the fifth time in his ten seasons as a starter, Brady threw for 5,235 yards (second highest total in history) and 39 touchdowns. He also registered a quarterback rating of 105.6, the second consecutive year he topped the 100 mark. 1. Aaron Rodgers - QB, Green Bay Packers: Rodgers has been nothing short of brilliant since taking the reins from Brett Favre in Green Bay. The reigning NFL MVP, Rodgers broke Peyton Manning's single-season record for passing efficiency last year with a 122.5 rating. 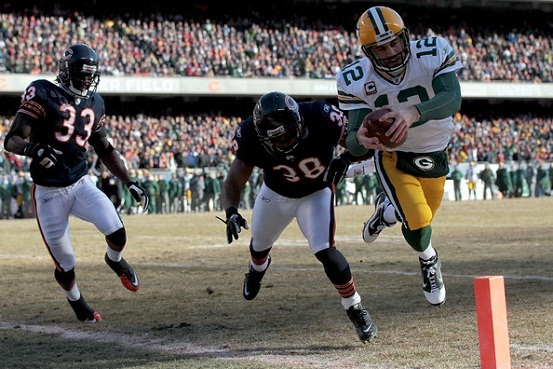 In leading the Packers to a league-best 15-1 record, Rodgers threw for 4,643 yards and 45 touchdowns -- in only 15 games. Well there you have it. We hope you enjoyed our countdown of the top 100 NFL players of 2011. With that, it's time to finally turn the page on last season and start fully concentrating on the 2012 campaign. For the record, that was a rhetorical question. Pretty solid top ten, but I would have put Brees ahead of Brady. I agree. Brees should be before Brady. That was super biased lol and Eli should be in the top 10. You guys act like putting Brady ahead of Brees is a crime or something. Brady got New England to the Super Bowl with the second-worst defense in the entire league last year, was RIGHT BEHIND Brees in yards passing, and threw FEWER interceptions. If I were REALLY showing favoritism, I would have put Brady at #1. And no way Eli was top 10. Who on this list was he BETTER THAN for the year? I had Eli at #20, with Welker, Forte, Rice, Stafford, McCoy, Ngata, Peterson, Graham, and Revis rounding out 19-11. Eli had a great season, but not great enough to vault him ahead of any of these guys. I wouldve have Graham in there before I wouldve had Suggs. You're saying he is the best LB in the laegue? I can't stand Suggs myself, but the guy was the NFL Defensive Player of the Year last season for a reason. So yeah, I'd say he was certainly the best linebacker in the league in 2011.